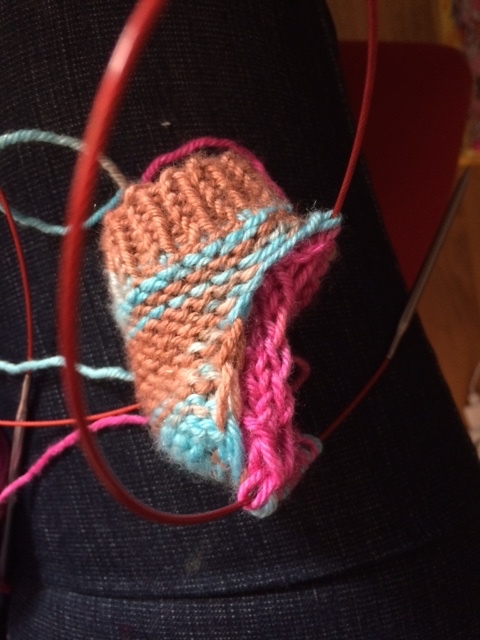 If you are a sock knitter like I am then you probably have played around with different techniques such as top down, toe up, magic loop, 2 circulars etc and maybe you have also tried the 2 in 1. It’s been a while since I discovered this technique and found a pattern on Ravelry but I had yet to try it out myself. 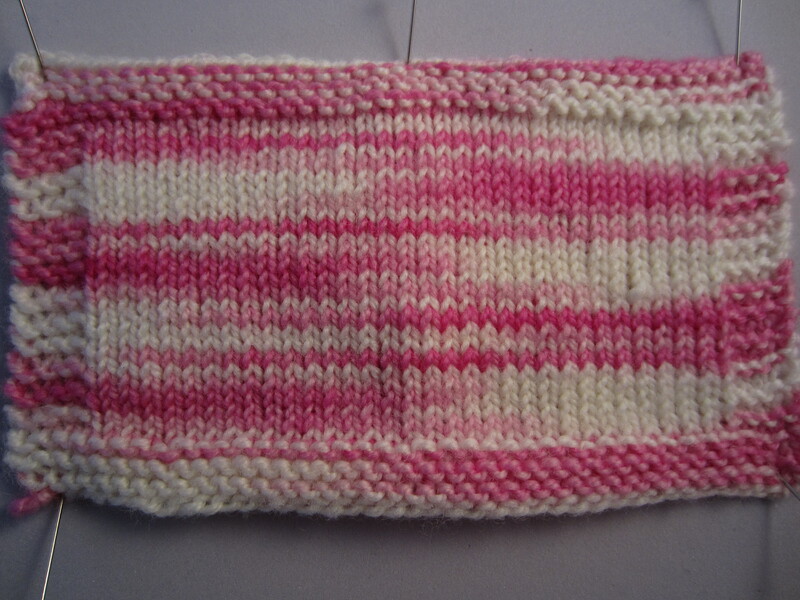 My problem is that I don’t like to do swatches, I just want to dive in and knit immediately and this seemed to be the sort of thing where a swatch or a test sock is IMPERATIF. 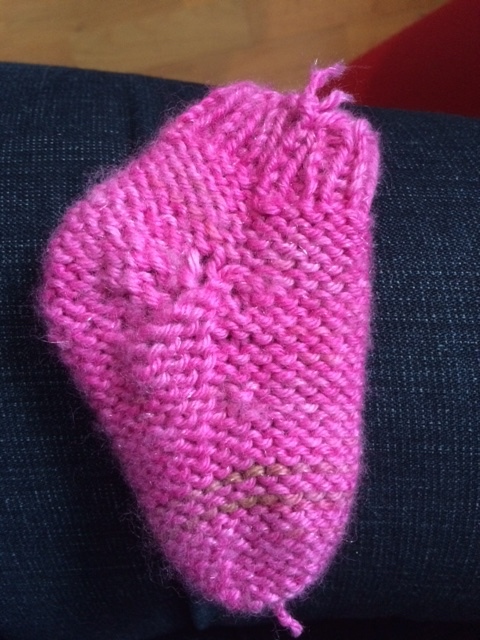 And now that I have done the test myself I absolutely recommend that you first knit the training sock BEFORE actually knitting a real pair. 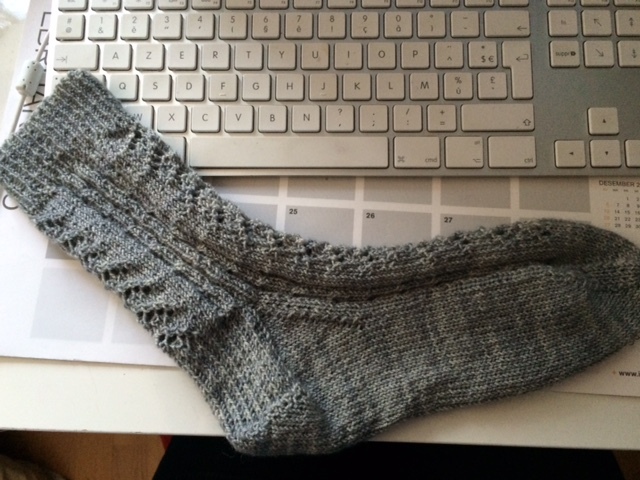 The pattern I used was The War & Peace Socks: Two Socks in One by Kate Atherley and this pattern is available for free from Ravelry. 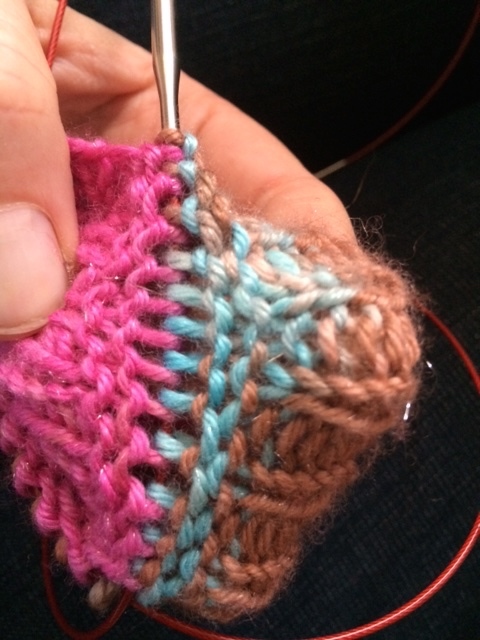 The instructions recommend using a rather thick yarn for this training version and to also use two different coloured yarns and that is a must I believe as you really have to remember which yarn is Y1 and which yarn is Y2. 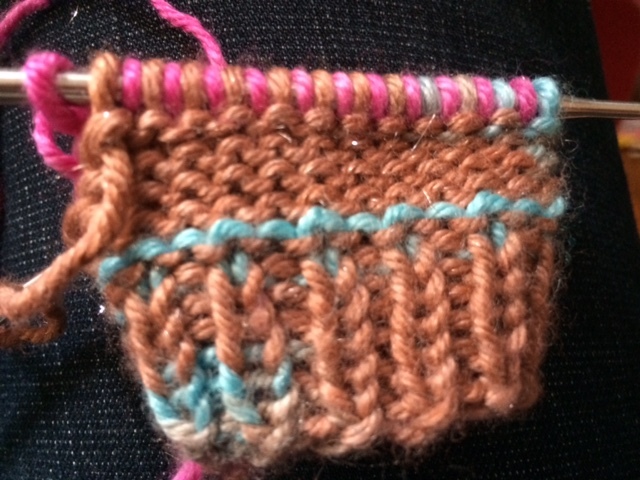 The beginning can be a little tricky until you understand that basically you are knitting two socks, one inside the other and that the right sides of the socks are facing each other. 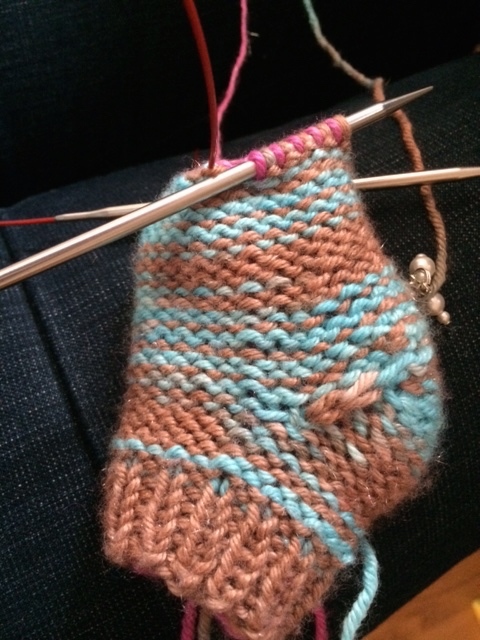 This means that the “outer” sock is knit by purling and the “inner” sock by knitting. This is the basic idea to grasp for this to be successful. 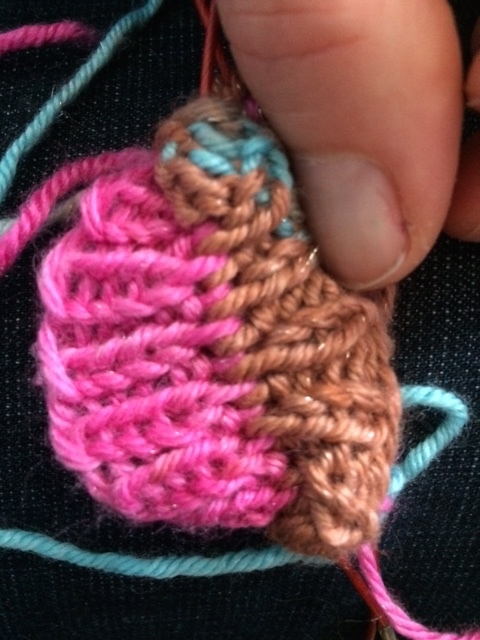 Another thing that is very important when using this technique is to ALWAYS MOVE YOUR YARN AFTER EACH STITCH. Now this is time consuming I think and may slow down the process a bit and you may even find this bothersome but it is an absolute must, otherwise you will end up with one double layered sock and not 2 separate socks! I did make 2 errors when knitting my training version and at 2 different spots I must have forgotten to move my yarn and when I finished my socks and separated them I discovered that they were actually “joined” in 2 places. Luckily for me, in both cases this had just happened with 1 single stitch. 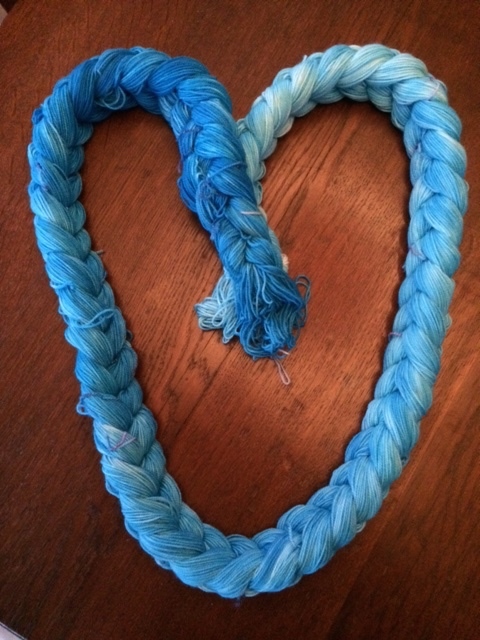 So what I did, maybe not very orthodox, I cut the yarn to be able to separate them and then just made a knot. As these are sample socks that’s ok but when knitting a “real” pair you definitely want to be concentrated so this does not happen to you. 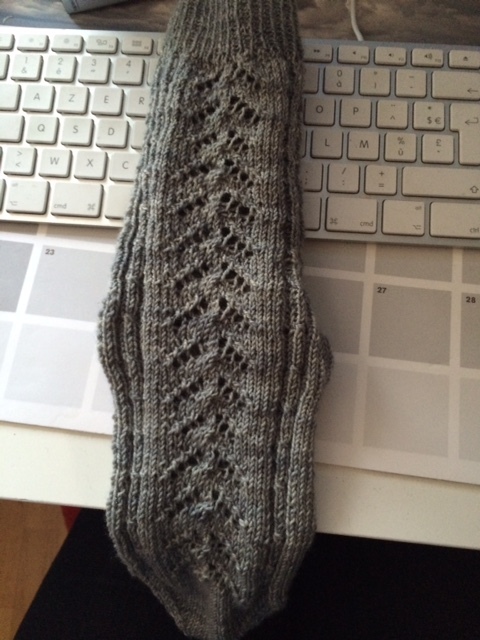 If you have not tried this technique yet then I recommend you do as it is rather fun and Kate’s pattern which is more of a template really gives you a number of possible sizes so once you’ve completed your training socks you can go ahead and make some for yourself. Here are some pictures I took of my training socks in progress to share with you and better explain the process. 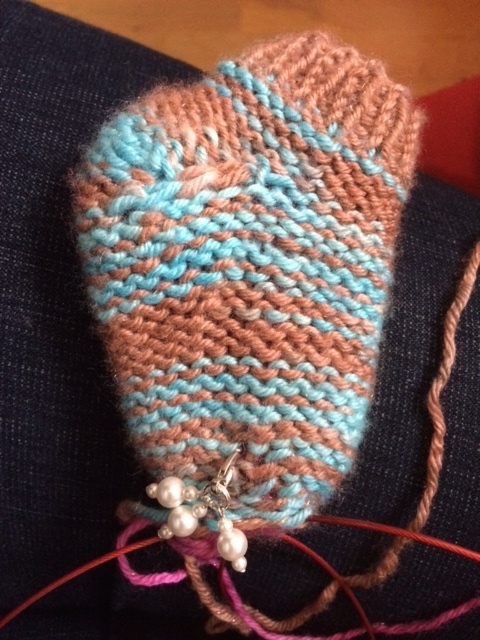 My conclusion is that this is a technique I’d like to master and last night I immediately went to dye some yarn for my first real socks knit this way. 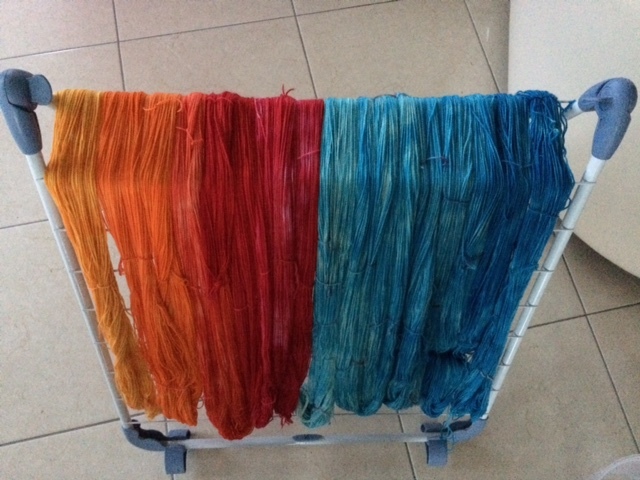 I really think it is SUPER important to have 2 different coloured yarns to begin with (at least) but I’m not a fan of wearing one blue and one red sock either so what I did was I dyed 2 skeins using the same colour only one was dyed darker and one lighter. 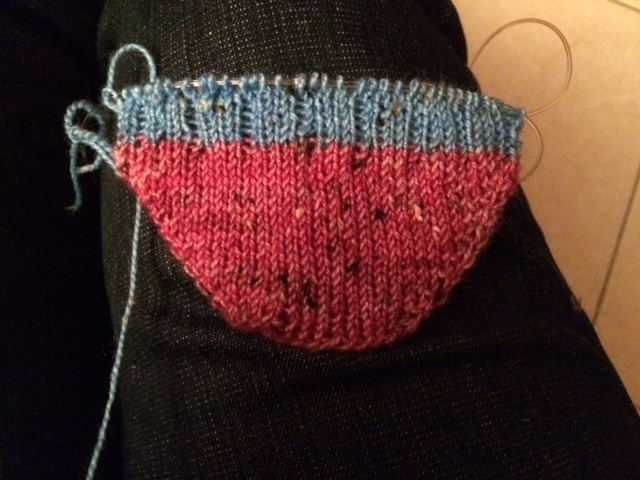 This way the socks are not too far appart colour wise but the colour is still distinct enough for me to be able to knit my first real pair without tears (I hope). As I don’t need 2 skeins for 1 pair I’m going to break them up into halves so there will be enough for 2 pairs like this. Would you like to try this technique using my yarn? 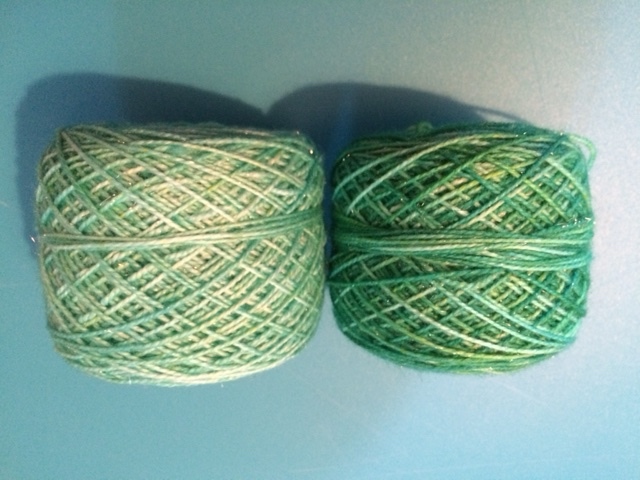 Leave me a comment below and I will do a random draw and the lucky winner will receive 2 yarn cakes of my glimmer yarn (75% superwash merino, 20% nylon, 5% silver stellina) in Emerald green. 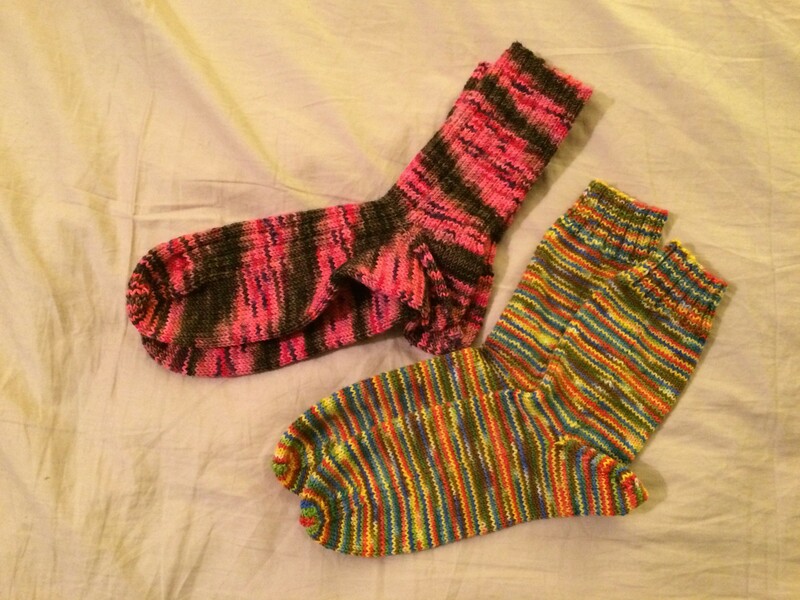 There is a catch however:) I would ask the winner to accept to share her/his experience and photos of the finished socks on her/his blog or social media and allowing me to link to it here on the blog. So if you are willing to do that and up for a challenge then now’s the time to leave me your comment. 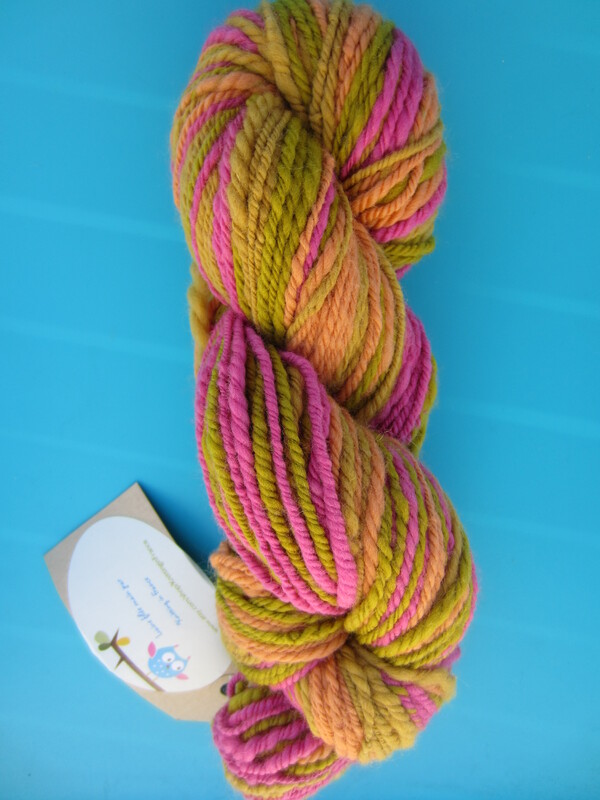 You have until Tuesday March 3rd to leave me a comment and come Wednesday March 4th I will draw out a random winner from the comments and announce the lucky knitter here on the blog. So I hope you are all up for the challenge, why not share with your other knitting friends after all, the more the merrier and sharing when trying a new technique is always helpful. 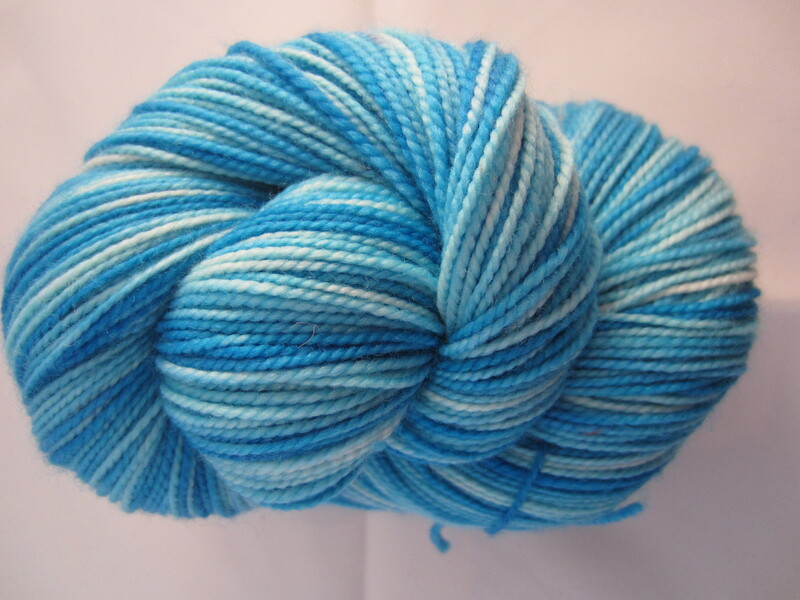 As promised this week I’m back to show you some pictures of the yarns I dyed last weekend. This time, rather than just showing pictures of the finished skeins, I’ll show you the yarn at different stages of production. 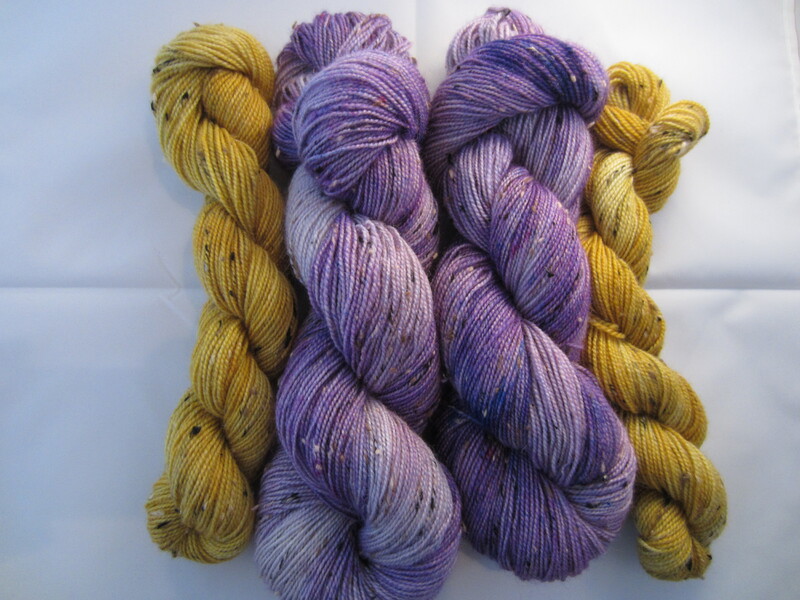 Then I did these also a while back – this is a blend of BFL and donegal nep yarn for a sturdy, rustic look (I feel). 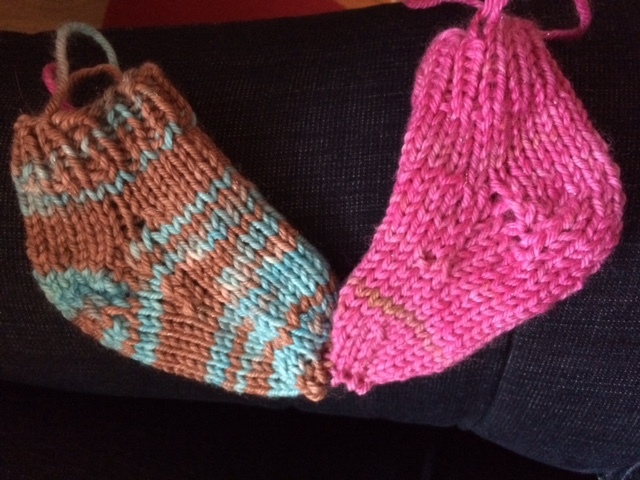 So the idea is to use the sets to knit 2 coloured socks such as the sample you see in the right side picture. 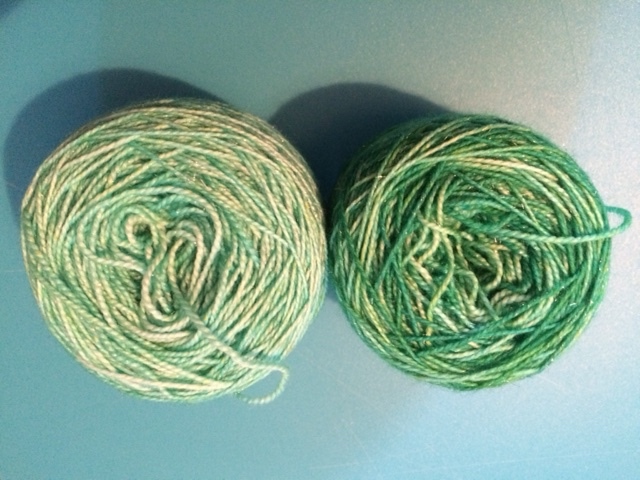 The larger skein is for the most part of the sock and the smaller one is for knitting toes, heels and cuffs. I actually did 2 more sets of these in a different colour combination today and will show those to you later. Here you see the orangy yarn skeined up And a knitted swatch Isn’t it funny to see how the yarn “changes” or how our perception of the colour changes depending on how the yarn is presented. 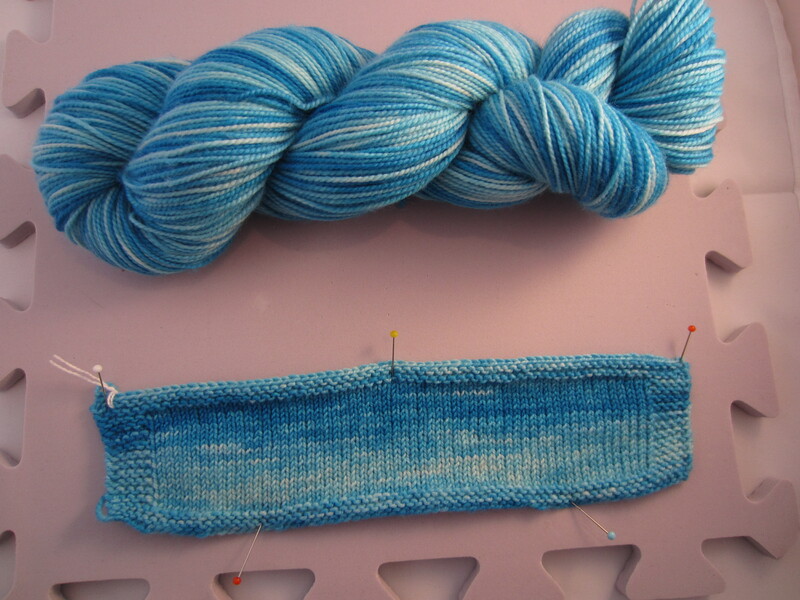 And then there is the blue yarn on the right side on the first picture where the yarn is drying. 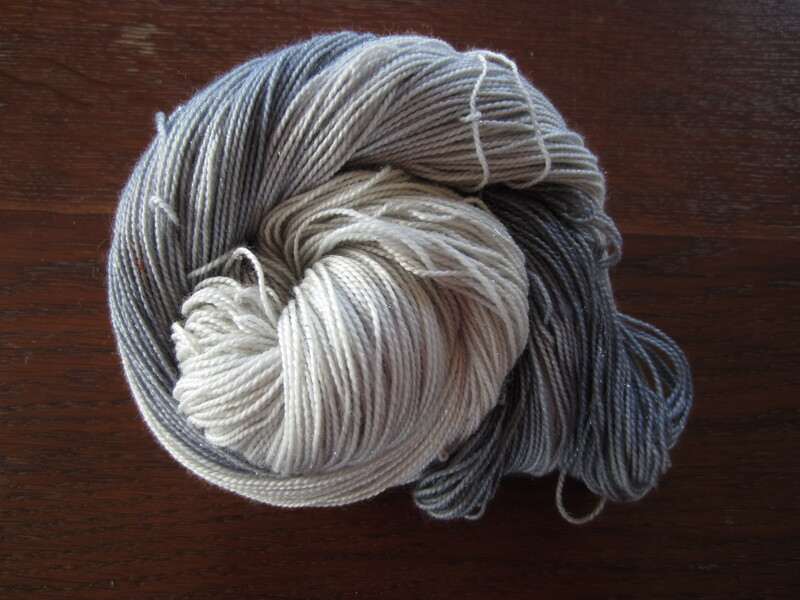 And to end, the last skein is my glimmer blend with 5% silver stellina (I love sparkles). 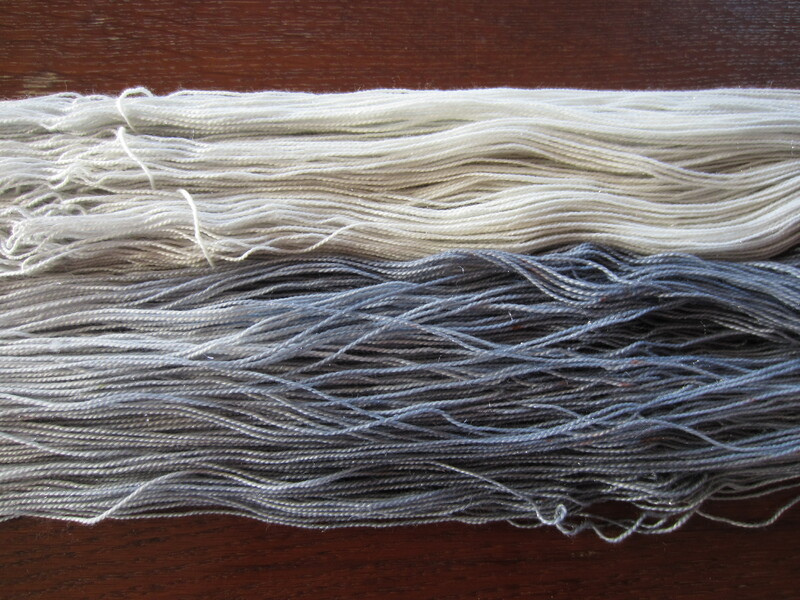 This time I did immersion dyeing but rather than immerse the skein entirely I immersed it in 3 times creating a gradient effect from dark grey to super soft tint of grey. 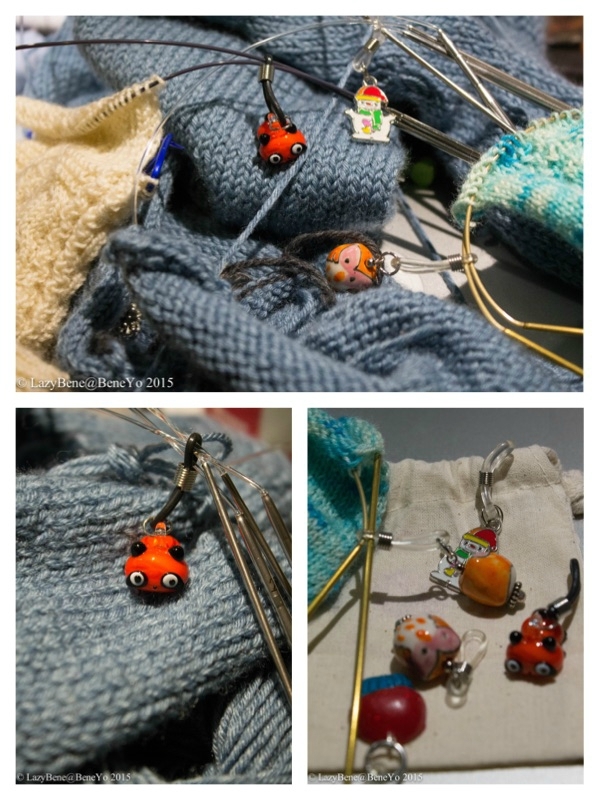 Hi there, last weekend the weather was very bad here in Normandy, no weather to do anything but stay inside and so I used the weekend to dye yarn and make stitch markers. 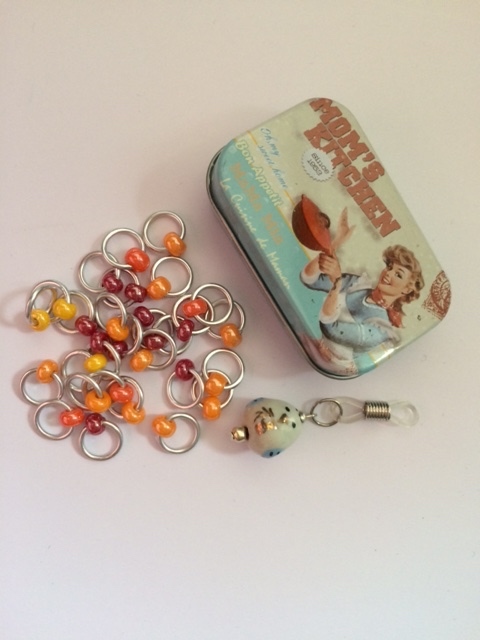 Today I’m going to show you some of these markers and share with you a review made by a fellow craft blogger regarding my hand made stitch markers and knitting needle holders. I’me very into “clusters” these days and made a number of sets using just that technique and here you can see one of my “cluster” markers. 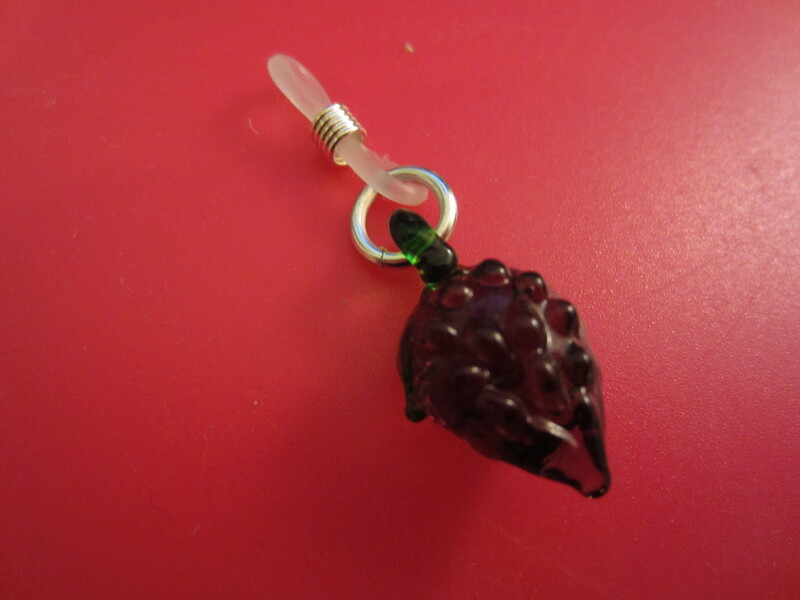 Even though it has a lot of beads, it’s still very light weight and easy and enjoyable to use so I’m definitely going to be making more of these. 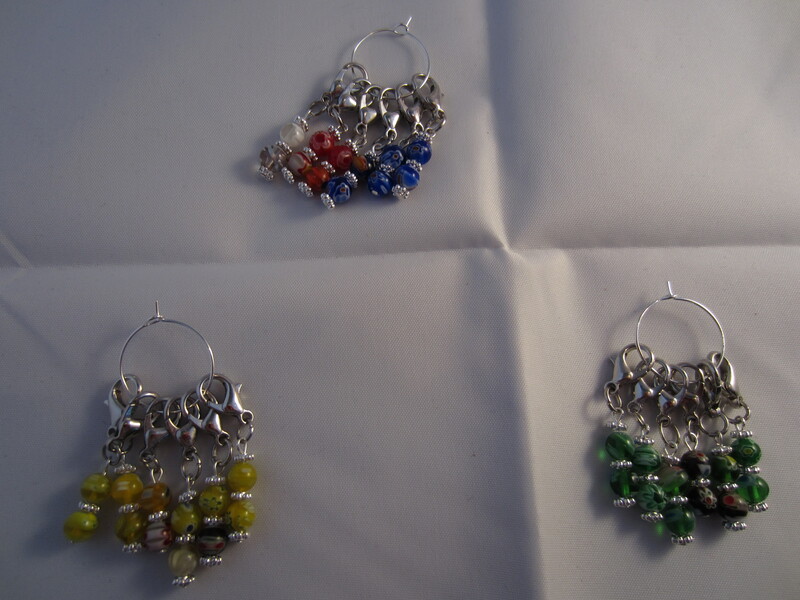 Then I made some with murano glass beads, you know the multi coloured glass beads where no 2 are really identical? 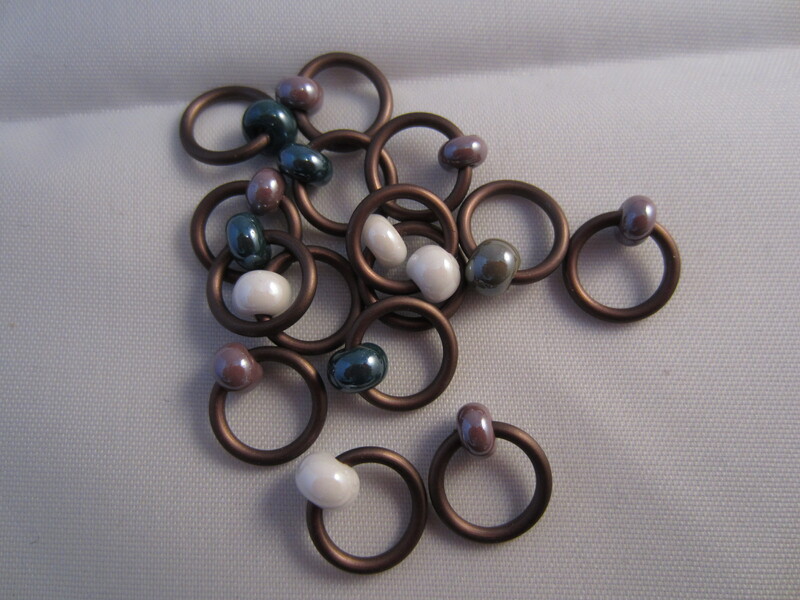 I made them up into sets of 6 and used lobster clasps so they can be used both for knitting and crochet. 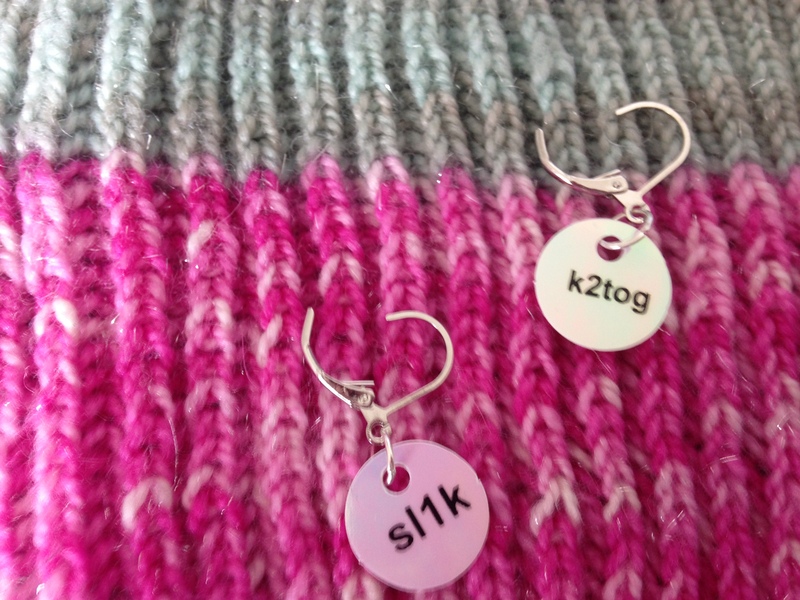 These can be used both for knitting and for crochet and can hang on your needles or mark a stitch in your knitting/crochet. 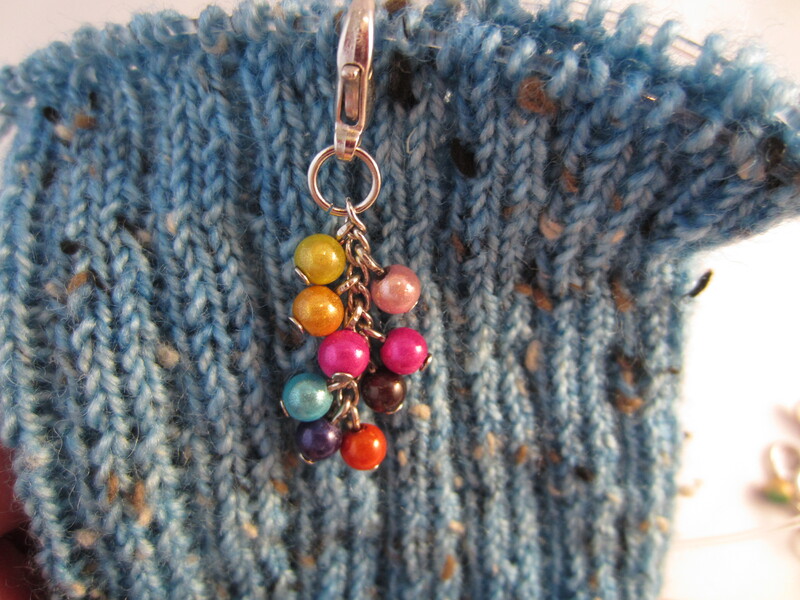 Another fun idea she gave me, was that she uses a lobster clasp stitch markers to “save” the last stitch crocheted between sessions and I imagine this is especially wonderful when on the road or when leaving your work in your project bag and a single stitch could easily slip of the crochet hook and even unravel! Hi there, I just had to share my joy with you all today! I just received my order from Woolgatherings after waiting for it for almost a month (yes the package was stuck in customs for almost 3 weeks). But now it is here and I LOVE LOVE LOVE my fibre and can’t wait to start spinning them. 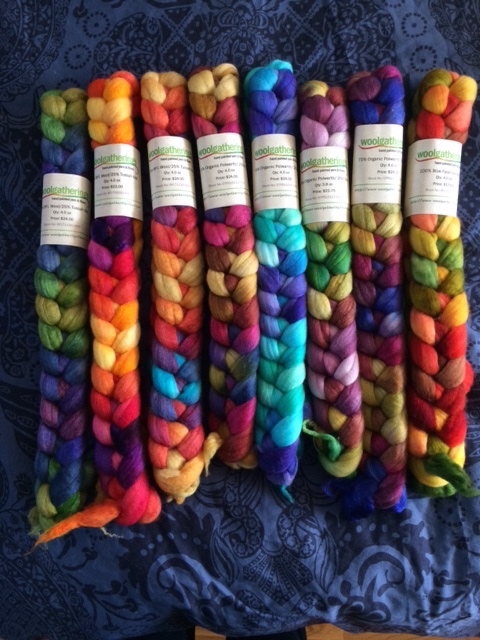 Some day soon, these beauties will be hand spun yarn treasures that will embellish my personal yarn stash – or yours if you want me to spin some up for you or if you are a spinner like myself and take a look at her shop I know you will be tempted to do as I did. BUY! 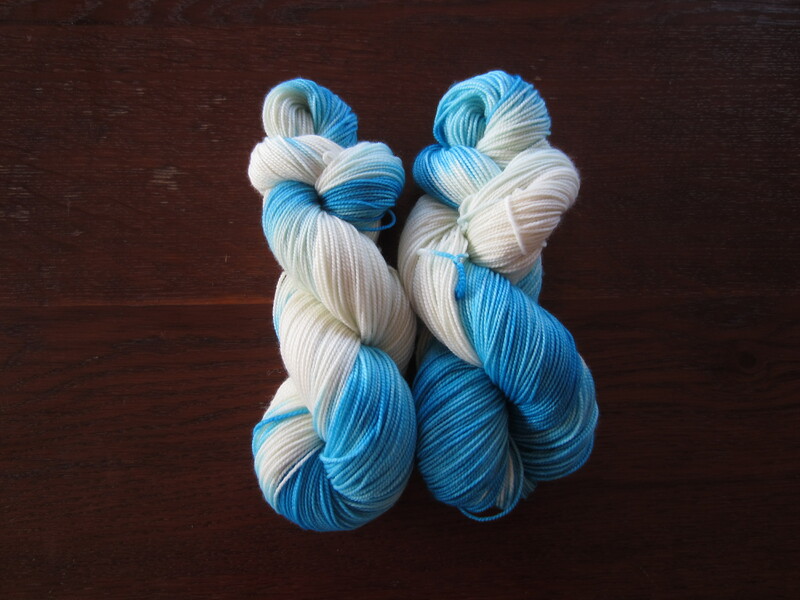 Woolgatherings is a family run business and Kate, the dyer, does a wonderful job. 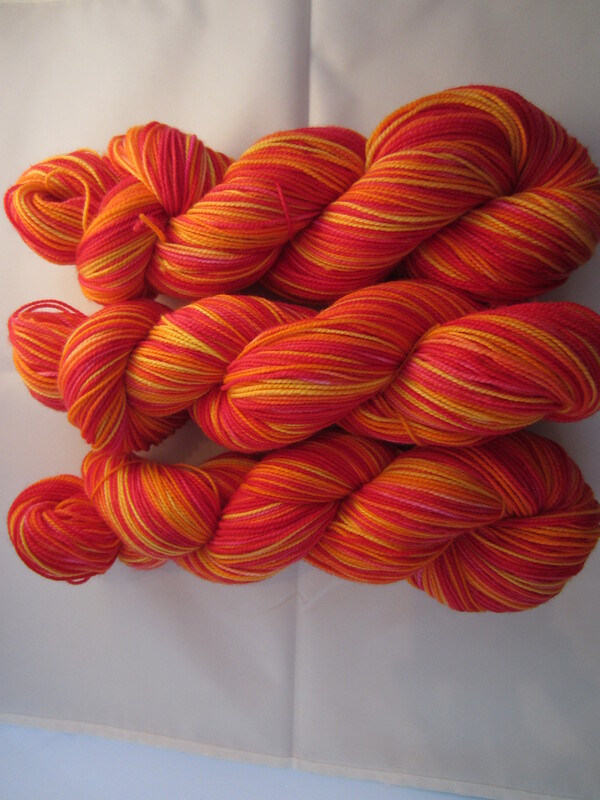 I’ve ordered from them before and just loved my yarn so that is why I placed this new order. 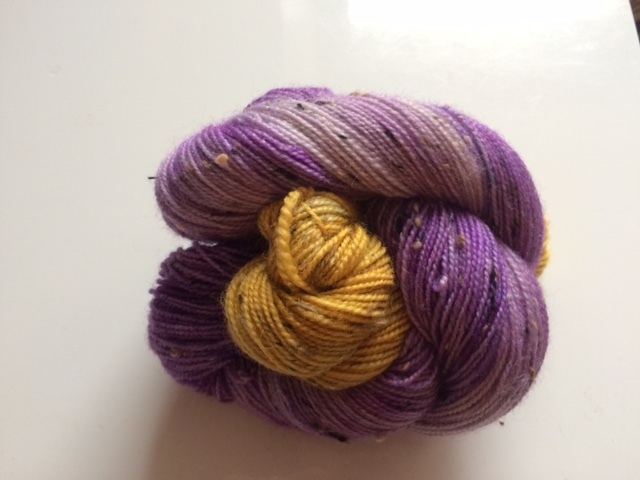 This time I went for mostly BFL + Tussah silk and Organic Polwarth + silk blends. 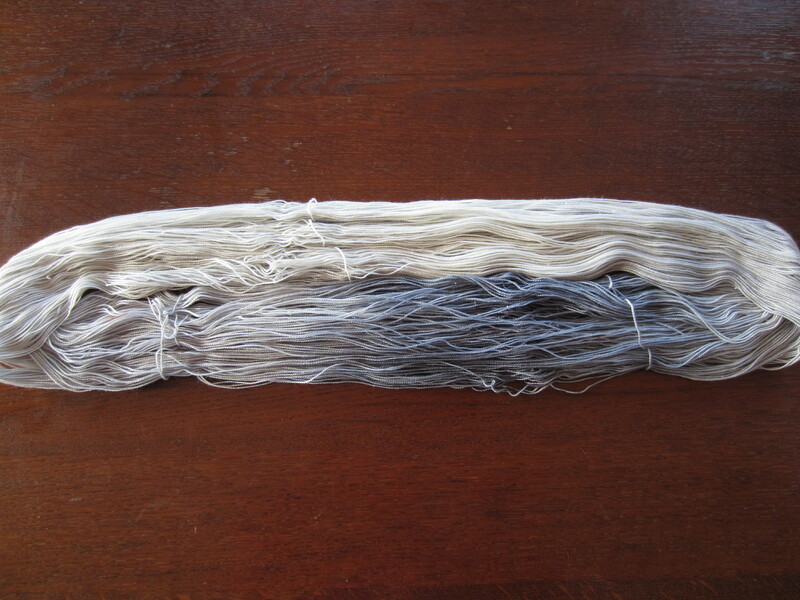 The silk will add strength and sheen to my finished yarns. I chose bright colours, which I love and are a staple of Kate. All the rovings are super soft and the colours are gorgeous. You will soon be seing these spun into yarn here. So here are my beauties: Do you get why I’m so happy??? I have another favorite dyer on Etsy and I also purchased some of her work last week and will be sure to share her work with you as soon as I receive my order. At this stage I have left my “cave” and gone to join the family in the living room. 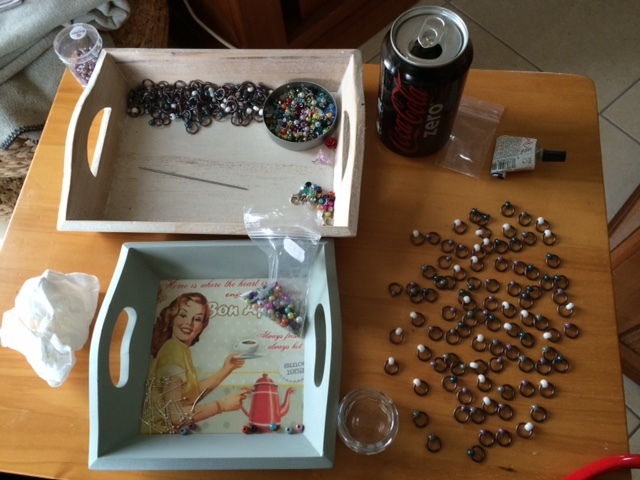 Here I had finished preparing the markers and have gone to the second stage where I glue the bead in place. And here you can see what I made that day. Lots of markers and you can see that I experimented with some “cluster” markers. I’m very “cluster” these days. I love making them and I think they look super cute. I’m only worried you may find them too long or be afraid of them being heavy. In fact they are super light weight so no worriers and I think they look to beautiful NOT to make some more! So I’m going to make some sets with one “super cluster” and the rest of the set will be small clusters. I hope you can see the photos well enough to understand what I mean by “cluster markers”. I also did some plying this last week. I admit that I love spinning and for some reason plying is not quite as much fun so I often find myself with a large number of bobbins full of beautiful singles and then I just plunge in and do as much as I can before I go back to spinning. 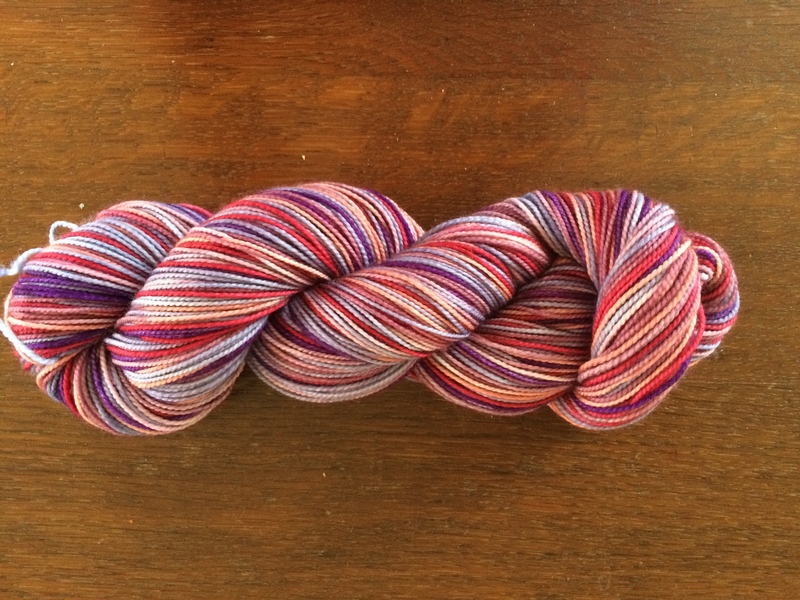 Here are some photos of 2 skeins I did using the Navajo ply method. 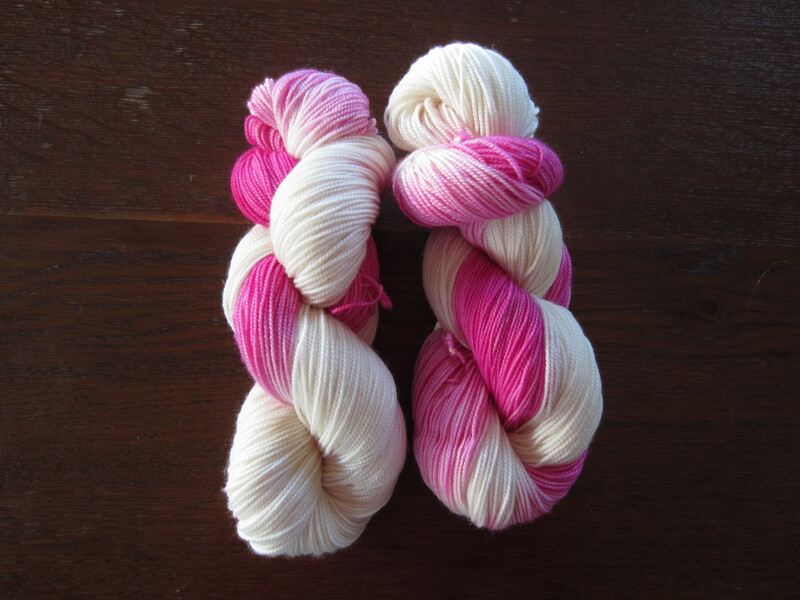 The red/pinkish one is merino and this is spun superfine so even though the finished yarn is 3ply it is sock weight. Really beautiful even if I say so myself 🙂 So now I just have to wash and block the yarn, measure the yardage and I’ll be able to list it for sale. 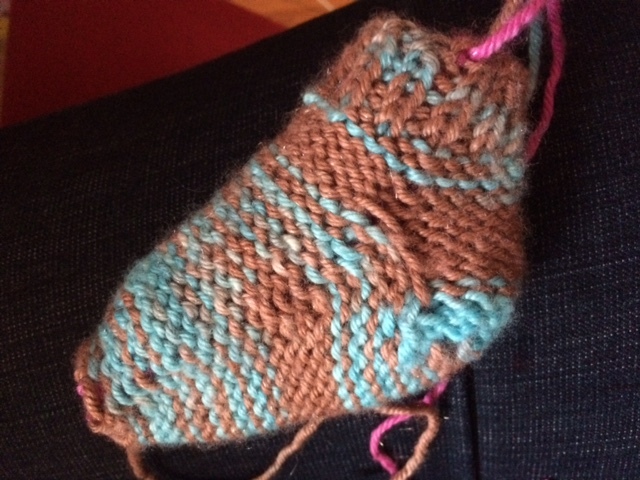 The second skein is a little thicker though not worsted weight, I’d say heavy sock rather. 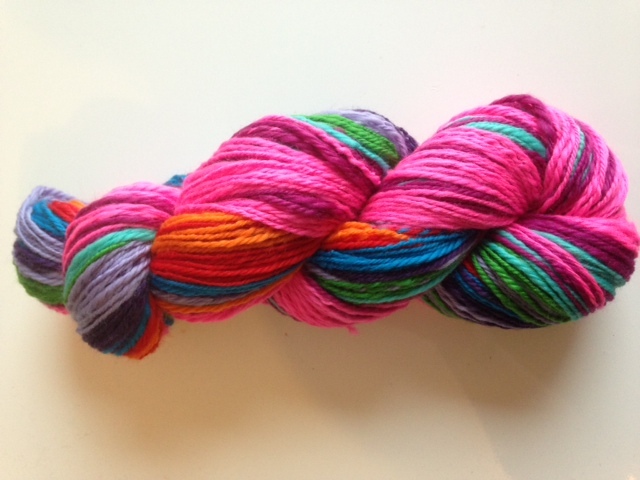 And this is a fun skein with lots of colours and colour combinations. In fact this is spun out of a sampler fibre packet I bought from Sweet Georgia. 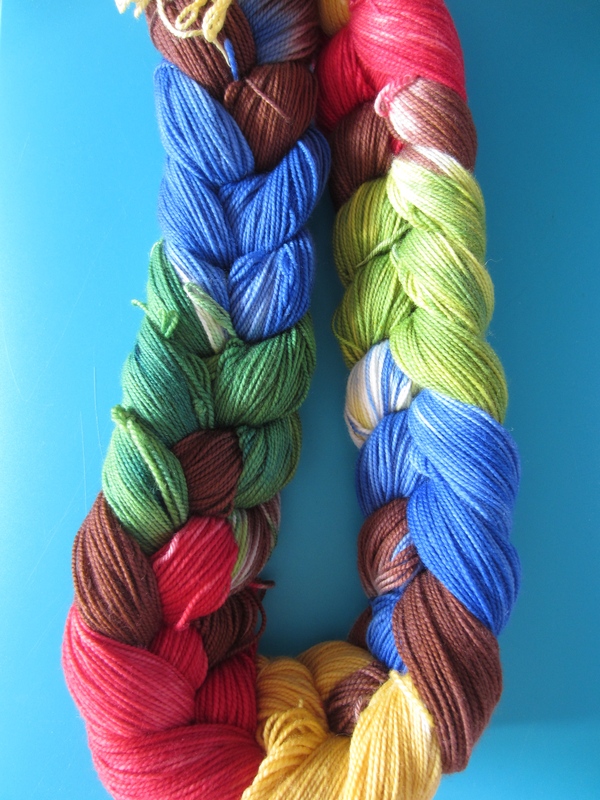 These are 6 mini braids of hand dyed BFL fibre. 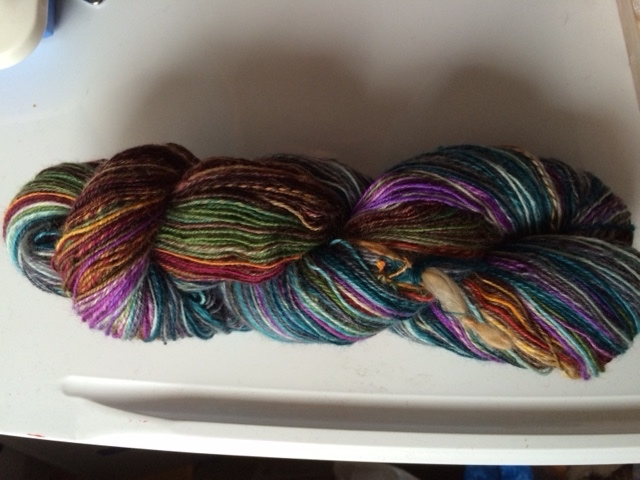 I spun them all into a huge bobbin of singles and then Navajo plied it all. 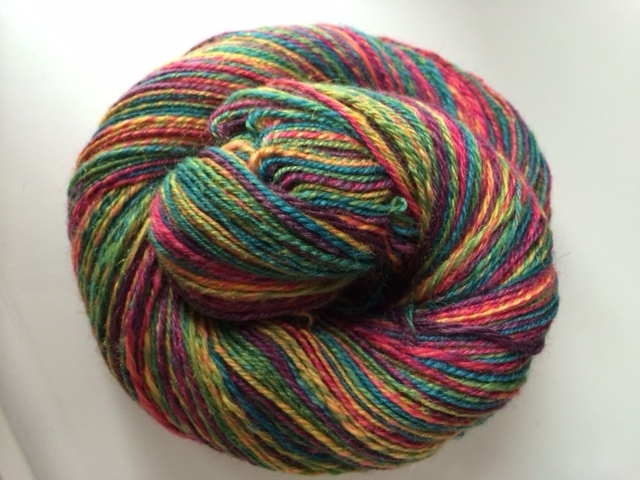 So I ended up with a 3 ply yarn with lots of colours and variations. I was thinking about maybe doing mini skeins in stead and breaking the yarn up as I came to a new braid/colour way but finally decided against it and I’m happy I did. 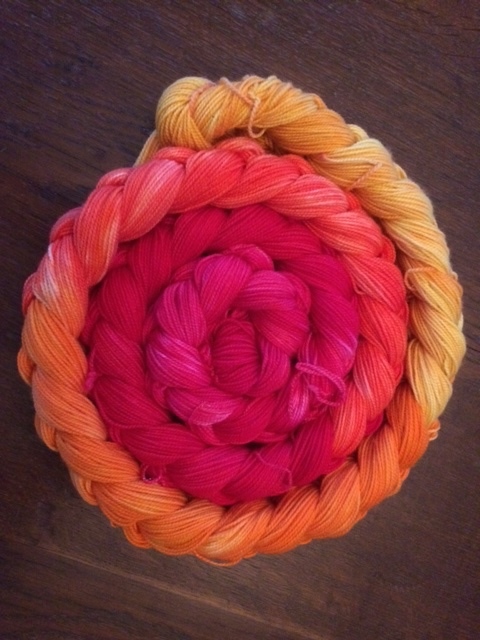 This yarn will be gorgeous knit up into a shawl or scarf or maybe a set of accessories like hat, cowl and mitts. There is lots and lots of yardage here to work with. But I also have to wash, block and measure before setting it up as a listing in Etsy. Before diving into today’s subject – space and lack thereof- let me share with you my latest knits and hand dyed yarns soon to be online. 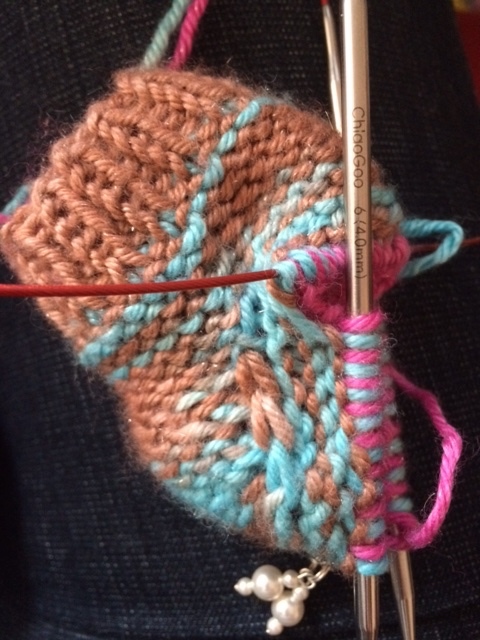 You may have noticed that I’m in a serious sock knitting phase these days. 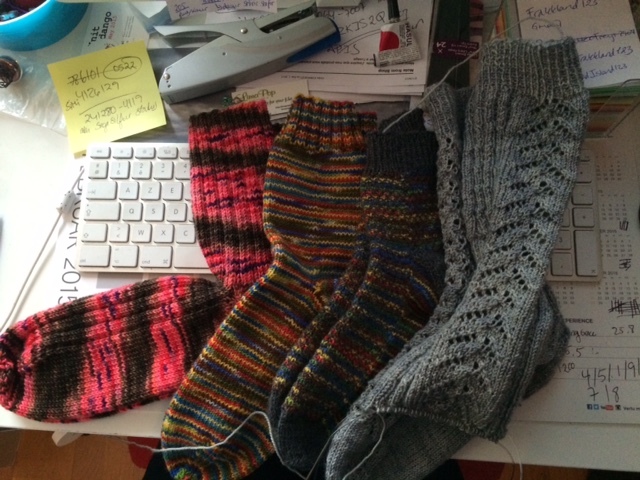 This February I have actually completed 3 pairs of socks and will complete the 4th this afternoon (only one toe left). And as if that was not enough I’ve CO for the 5th pair!! You may be thinking that it REALLY is time to knit something else but I actually have an excuse for knitting pairs nr: 5,6 and 7! YES, that’s right 3 more pairs. How is that possible? 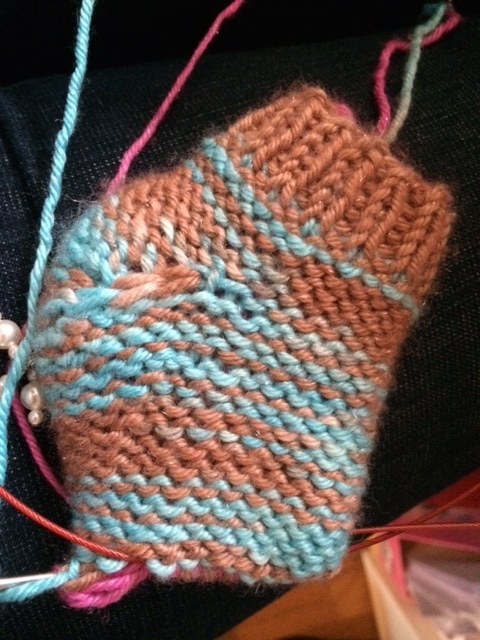 Well I have to knit sample socks with my hand dyed yarns so you can see what they look like once knit up into socks. 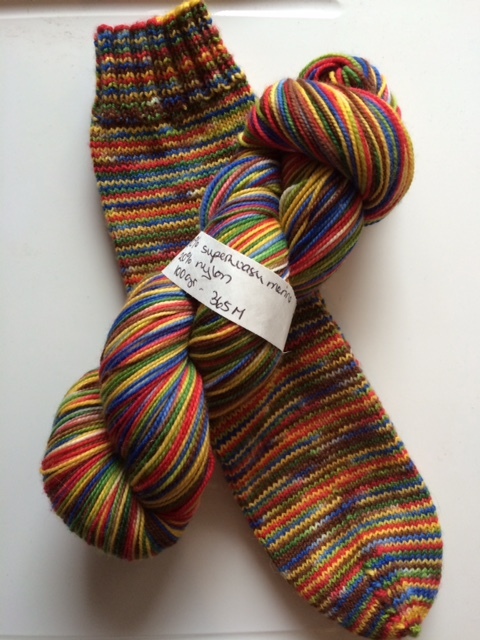 So here are some photos of my socks so far and my latest hand dyed yarns. So here you see my completed pairs and the last one on the right, I’ve only got the toe left on the second sock 🙂 And here is my 5th pair. 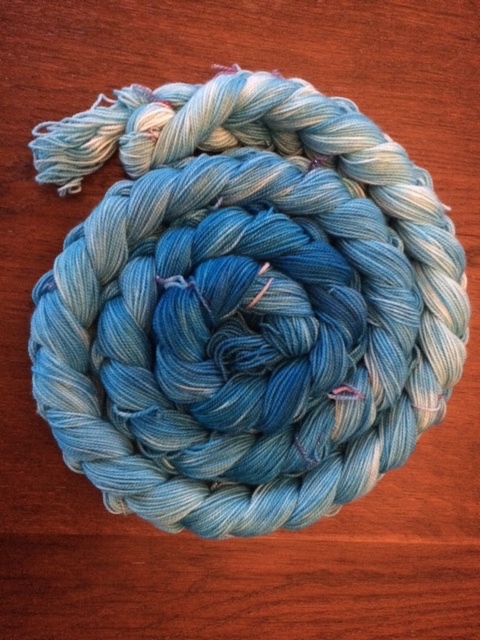 This is yarn hand dyed by myself and the pattern is also made up by myself. 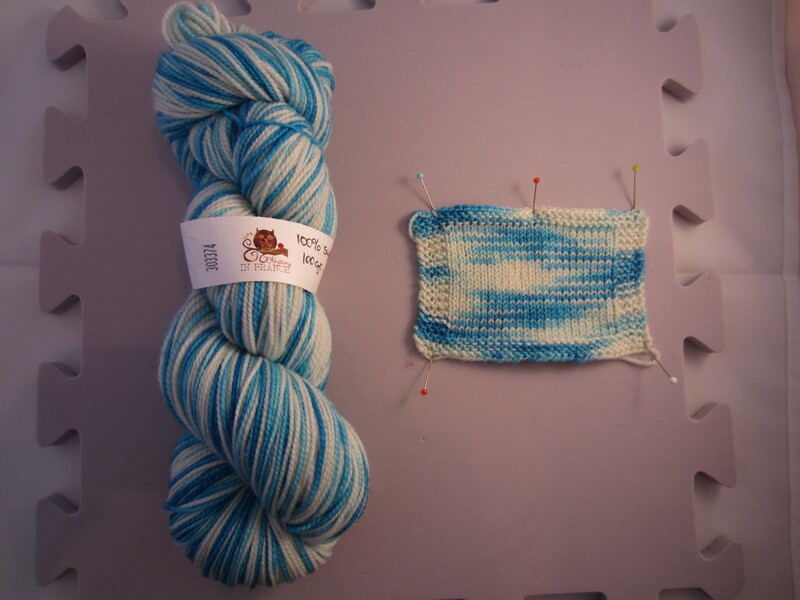 This is a project I’m working on and the idea is to sell sock kits for 2 coloured socks including hand dyed yarn, pattern and possibly something like stitch markers or other fun things. And now after having inspired you to knit some socks and tempted you to maybe buy some more colourful yarn, it’s time for the less amusing side of stash enhancement: space (or lack thereof) and organisation. If you are reading my blog, chances are that you like hand made items, DIY crafts and especially all crafts related to fibre. That assumption leads me to another one: that you too have been confronted with THE SPACE ISSUE! I suppose some of you are serious people, with responsible stash acquisition capabilities and that as such your SPACE PROBLEM is mild to moderate. If that is your case, BRAVO, but would you mind sharing your tips with the rest of us? I suppose, or should I say, hope, that there are others out there with the same degree of SPACE PROBLEM as I have. If not, I guess I really am crazy! Let me explain: I love crafts! 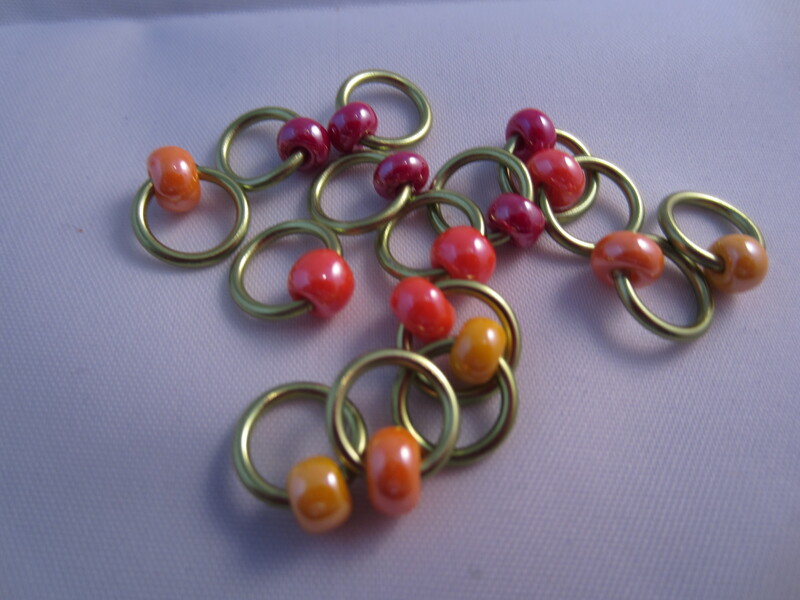 Those include beading, polymer clay crafting, felting, knitting, crocheting, spinning, carding, dyeing etc. 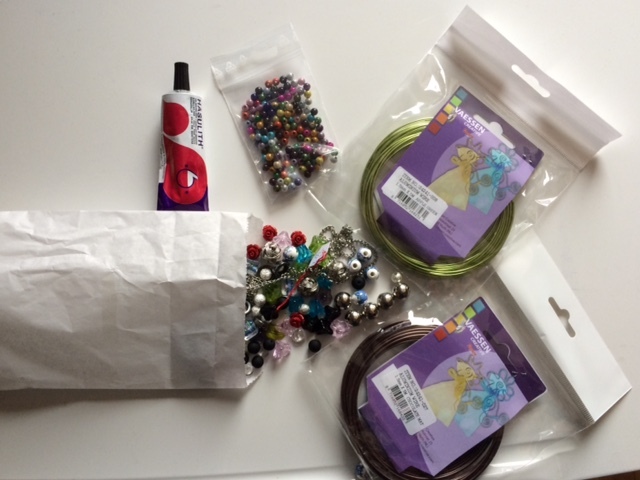 Now as a true crafter I need a minimum of supplies for each of those crafts and the better I get at each or the more I’m intrigued, the more stuff I need. After all this you cannot expect me to learn and get better at what I do with out the best of everything and LOTS IF IT! Supplies and tools take up space, lots of space. At the beginning I only had a yarn stash and a manageable one at that. But as time went on, the more I was caught up in the fibre arts and the more my stash grew and even diversified. 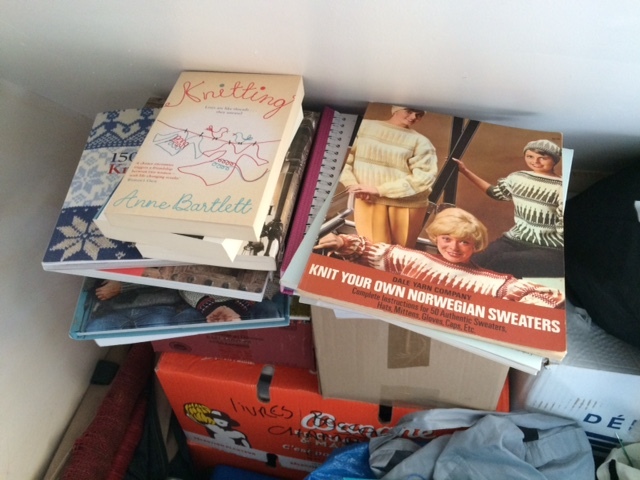 When there was just yarn, I’d stash some in my room, then in other rooms, my living room, my cellar… You get the picture. When my husband began complaining about yarn all over the place, it was time to move into a bigger place. And that of course opened up new opportunities in stash enhancement. It also got me going in the tool enhancement. And when my personal supplies started to look seriously like the stock of a medium sized craft store something had to be done. I launched my online business! Selling fibre related supplies online! A dream come too. No need to come up with excuses about having yarn or fibres EVERYWHERE! At the beginning I was super excited and wanted to stock just about everything and had I had the finances and the space to go with that, I would have. But my finances were limited and so was my space. 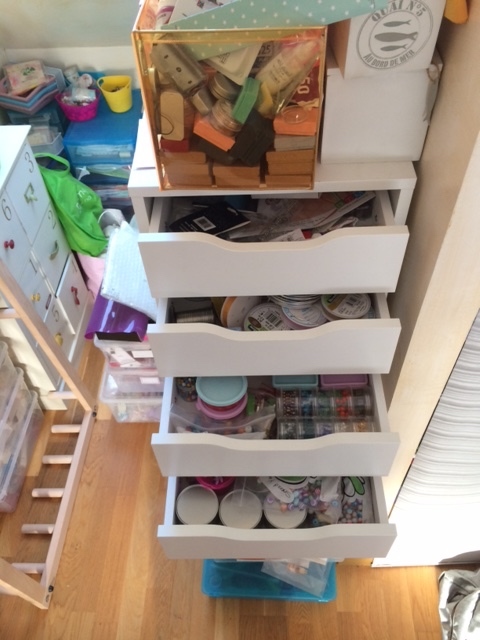 With time I have learned to control my stash/supplies enhancement urges but space is still an issue. I do have a place for the stock I sell in my shop but my personal stash of yarn, fibres, needles, crochets, spindles, spinning wheels, dye stuff, beads, jewellery making supplies etc are still to be found just about all over my house. I have a dream and in it I have this real studio to work in, say 30m2 where I’d have lots of shelves for my extensive collection of craft books, some clever storage units to store them and at the same time show off my yarn and fibres. A comfortable chair and couch to sit in when knitting/crocheting. 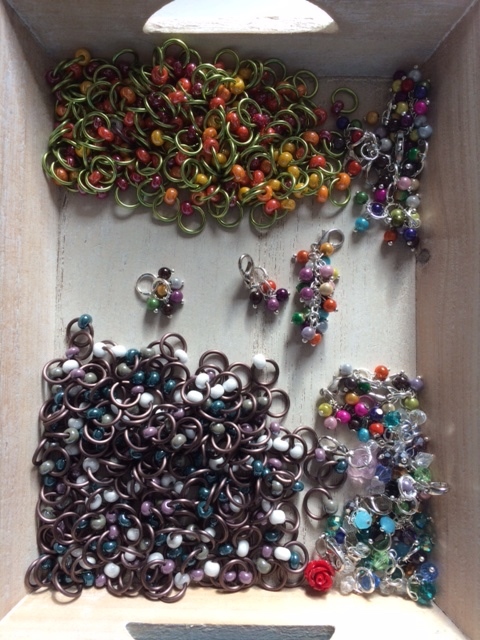 A work corner with a large table and lots of drawers and boxes for all my beads and supplies for making stitch markers. A table for my light box/photo studio. 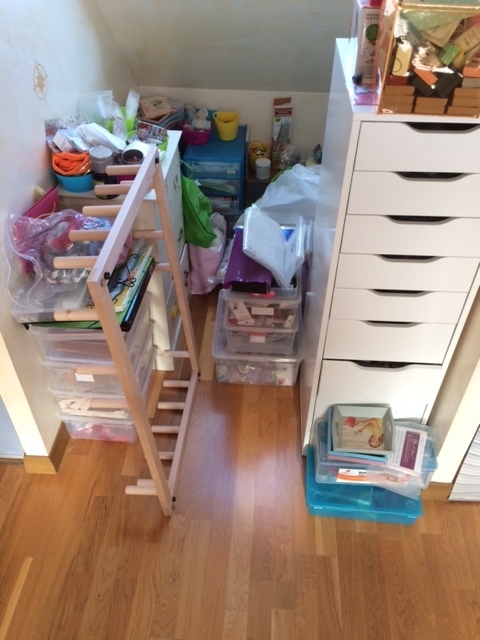 A corner for spinning with a comfortable chair, my wheels and spindles and some clever storage unit for my fibres. Another space for dyeing with lots of shelf space for stocking un dyed yarn and fibres, my dyes and all my accessories and tools for dyeing. A large table for working dying. A wall mounted warping board and room for my swifts, ball winders etc. and let’s not forget that I do run a business so there would also be an office space with all the necessary equipment. Wow! That’s a lot of things. Maybe 30m2 will not be enough, maybe I need 50m2. What do you think? Here are a few photos to show you the state of things and please note this is my personal stash and not the stock for the shop. And then there are the books. A lot are in boxes since my last move but as I continually buy more, my night stand and every available space in my room is also full of books on all sorts of fibre related topics. Do you have pictures of you stash? 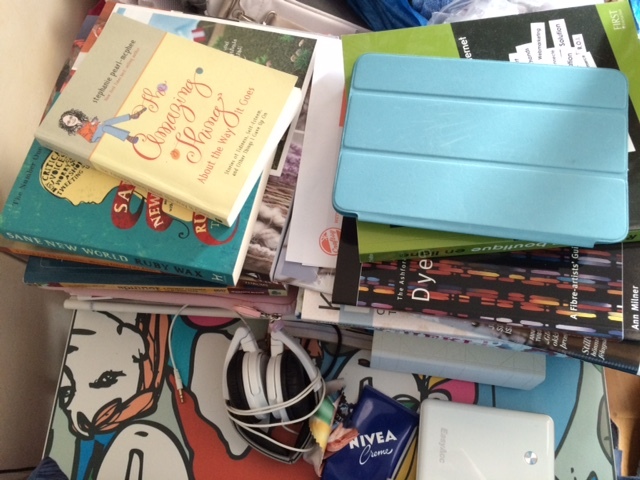 Organised or not? Do you dare share them with us here ? As a therapeutic support for us that have this “stash overtaking our home” syndrome? Hi there, it’s been a tough week but I thought I’d write one last post to make for a good beginning for this weekend. Today I’d like to talk about Pinterest . Are you familiar with this social media platform? I’m told it is the fastest growing social media in the world these days and I’m honestly not surprised. So why do I find it so great? Well because it is like a virtual library with billions of genious ideas for everyone and everything. You can virtually search for pins in every domain and that is so great. And just wandering through these pins I continually find myself jotting down new things to do, new techniques to try out, finding an idea for my business, my office, my dream work studio etc. I’ve created boards for different things I’m interested in and not all are for knitting or crochet (though most are). My most popular board is the one called Knitting Inspiration and at the moment that is where I share all things knitting related. Rather than making separate boards for patterns/tutos/techniques/socks/shawls etc I have chosen to include all my Knitting Inspirations in one board. And since I started this board my “to knit” list has grown exponentially. But I have also learned new things and discovered new patterns, new designers and fun ideas. I also have a similar board for crochet which I just call Crochet which also includes patterns, tutos etc for regular crochet and tunisian crochet. 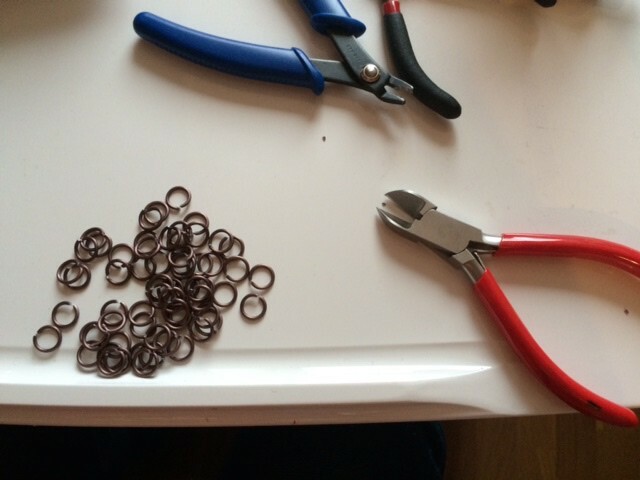 But I also have boards for beading and jewellery as I have fallen for those and now use techniques learned through Pinterest to improve and make new stitch markers. I also have some boards for fibre and spinning and hand dyed and hand spun yarns. There are so many ideas out there. All in all I have 40 boards but when I look closely I’m probably only active on 10-15 of them so I may have to do some cleaning/reorganising there. For me Pinterest is a place where we can share great ideas and show off our accomplishments as well as learn from others when we are not teaching our fellow pinners something we do well. And in my case I really think that I’m more inspired by Pinterest than Ravelry when it comes to my work with fibres – and we all know that Ravelry is huge so that says something for Pinterest. So if you are looking for inspiration for your work or just enjoy looking at beautiful things, learning something new and sharing your finds with others then Pinterest is definitely a place for you. I invite you to subscribe to my boards for inspiration and also if you already are on Pinterest, share your username with us so we too can subscribe to your boards for even more fun and inspiration. More on that later, so until then have a great and creative weekend. Hi there, a while back I told you about my celebrating my 1,000th sale on Etsy and that there would be 2 lucky customers. N°1 the client that actually purchased the 1,000 item and another one drawn out at random. So I have passed the 1,000 sales limit and informed my lucky customers and shipped their winnings so now I’m going to share those with you. 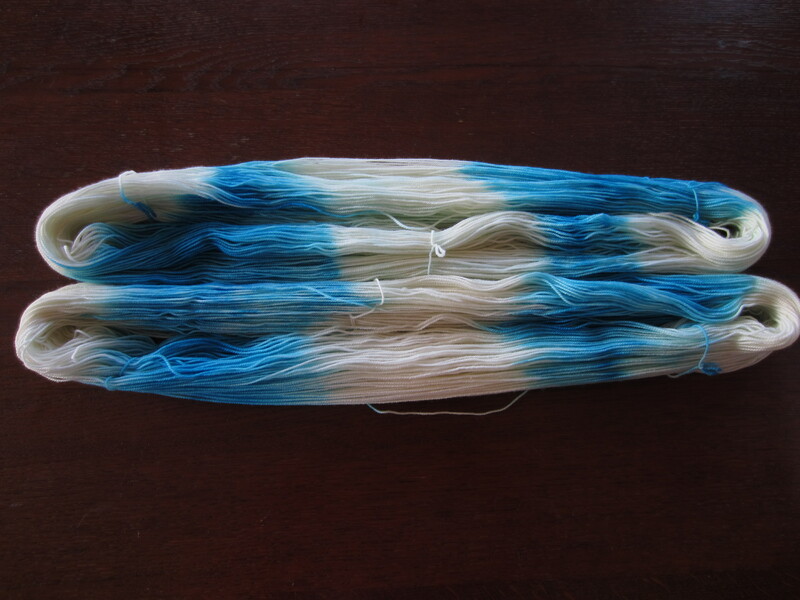 Here you can see the skein after dyeing/washing/drying. 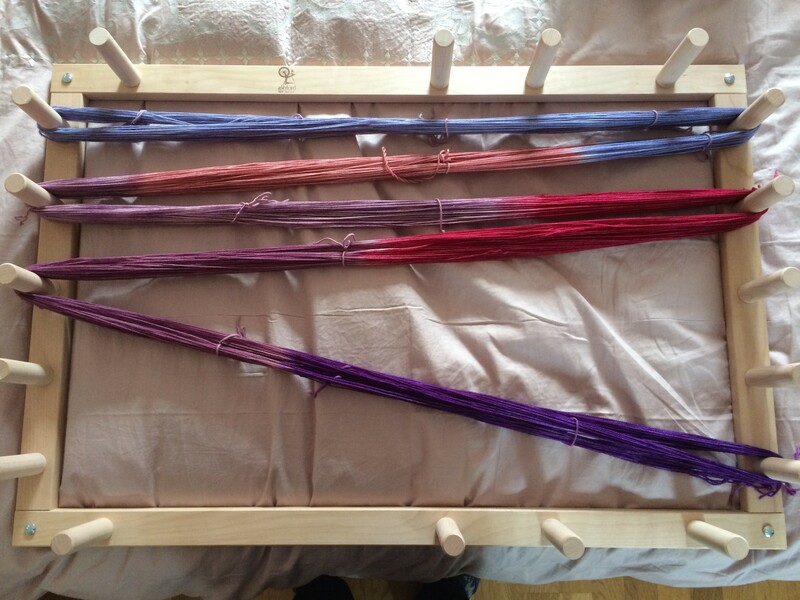 I loosely put it on the warp board before cutting off the ties and rewinding into a skein. You can see the different colours well here. 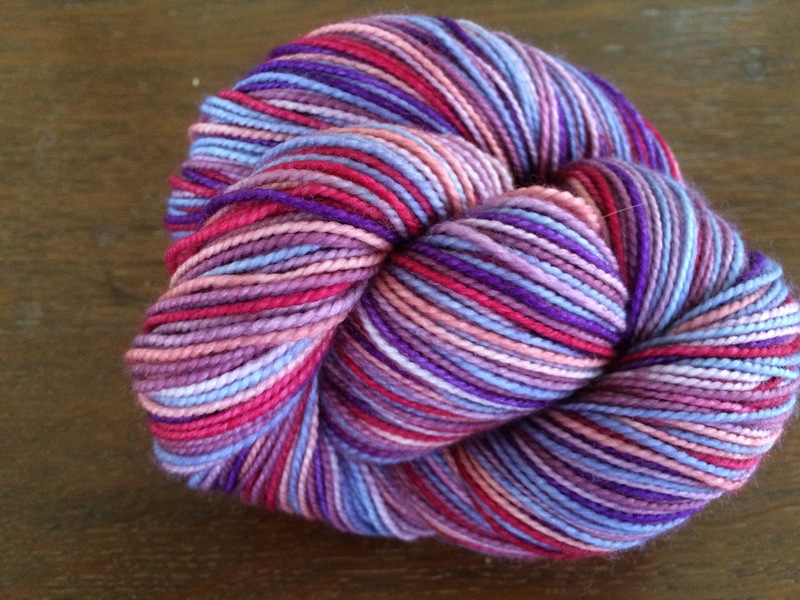 Here you have the skein all wound up. The colour difference has to do with lighting I think – incredible how that can change our perception of colour! 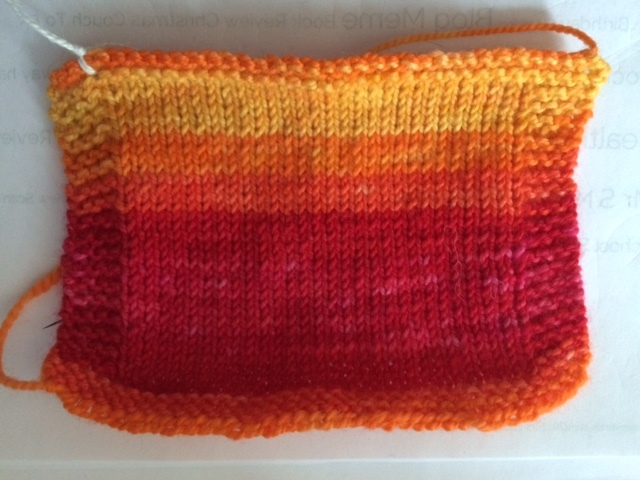 The second photo is actually closer to the actual colour of the yarn and I’m rather happy with the outcome. 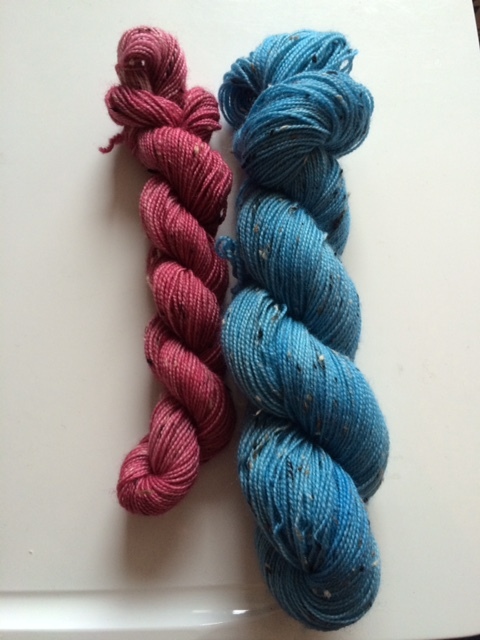 If you would like to purchase a skein hand dyed just for you, that is always possible. You would just have to contact me and give me your type of yarn, weight, colours and variety (solid, semi-solid, varigated or striping) and I’ll get back to you with a price. 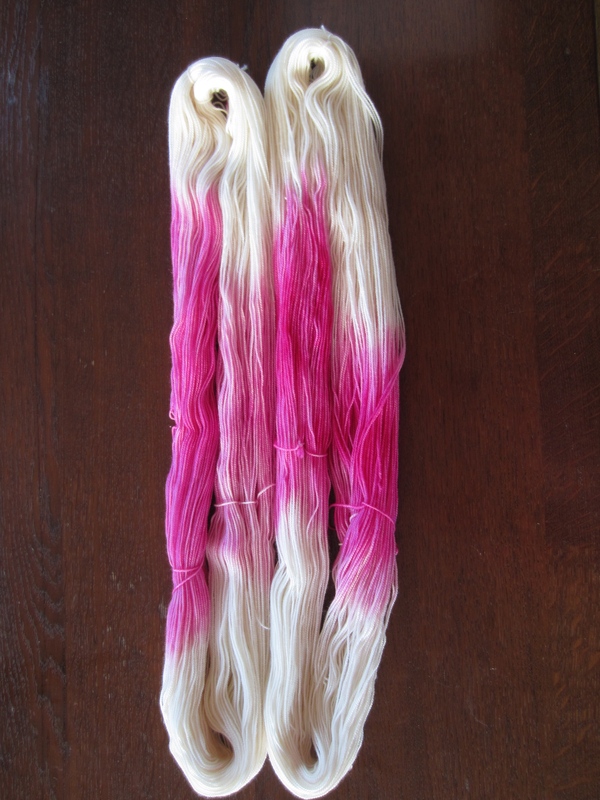 Once the dyeing is done, I send a picture for approval before issuing the invoice. So why not? 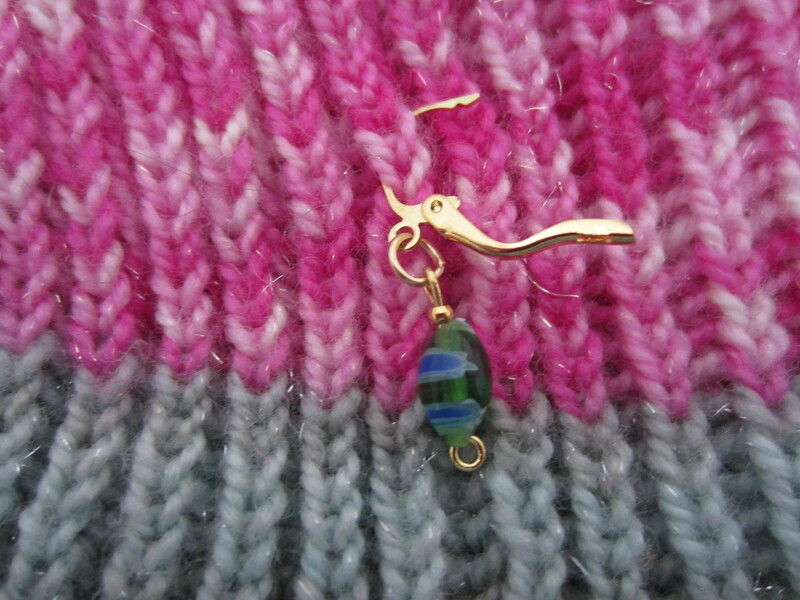 Could also be a great gift for a knitter friend or a special occasion don’t you think ? Now as for her actually winning here it is: Nice don’t you think ? So here goes, I have 2 1/2 pairs done The red/brown ones are Jitterbug yarn from Colinette and the multicoloured ones are hand dyed by myself and I will be writing a post about the process here shortly. 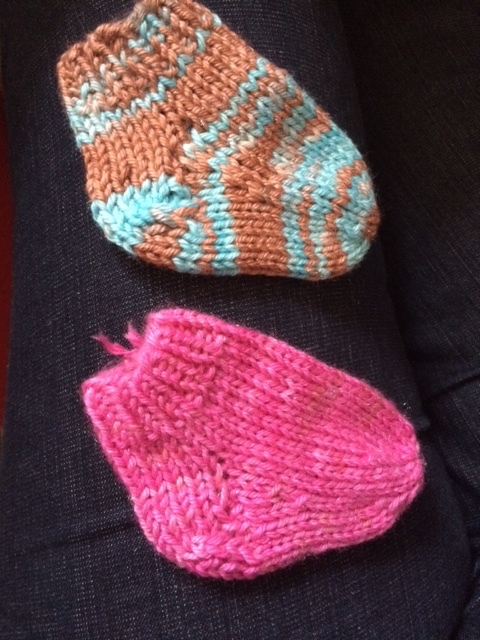 I have finished 1 sock and started the second one in this pair. 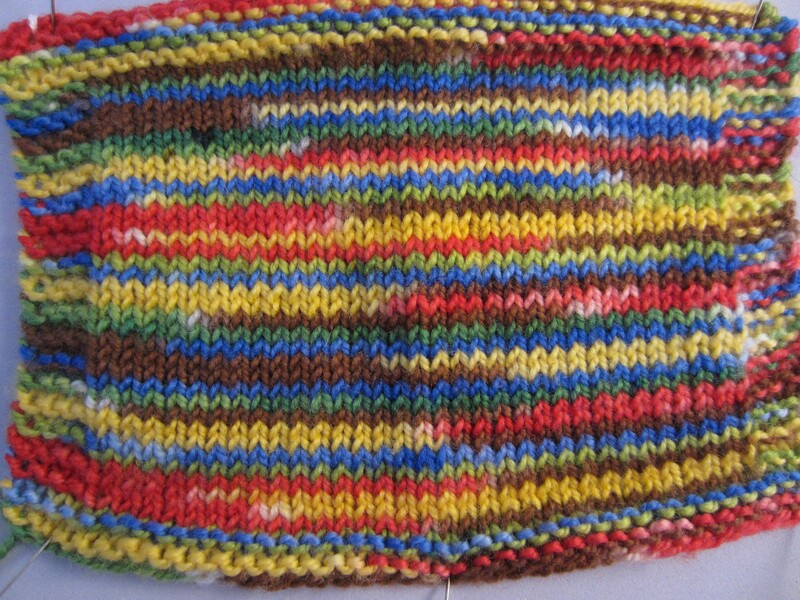 This is part of a Knit From Your Stash KAL I participate in on FB. 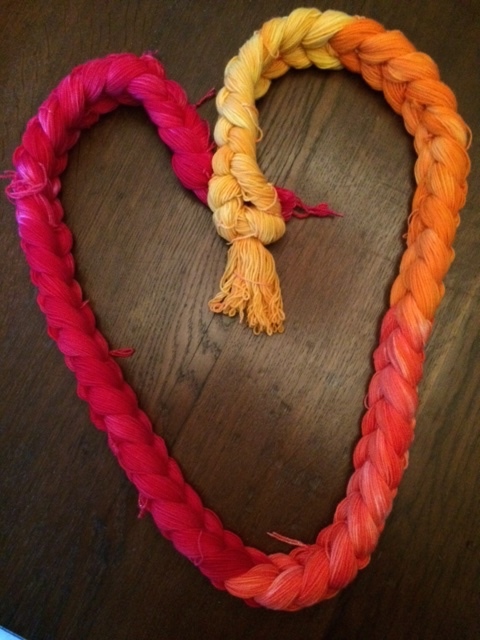 The yarn is hand dyed by myself. 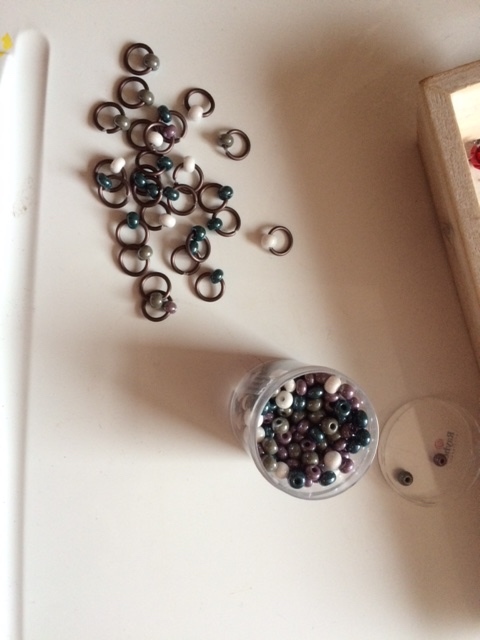 And then there is one paire I’m doing for my youngest daughter and she asked for a mix of multicoloured and a solid grey. 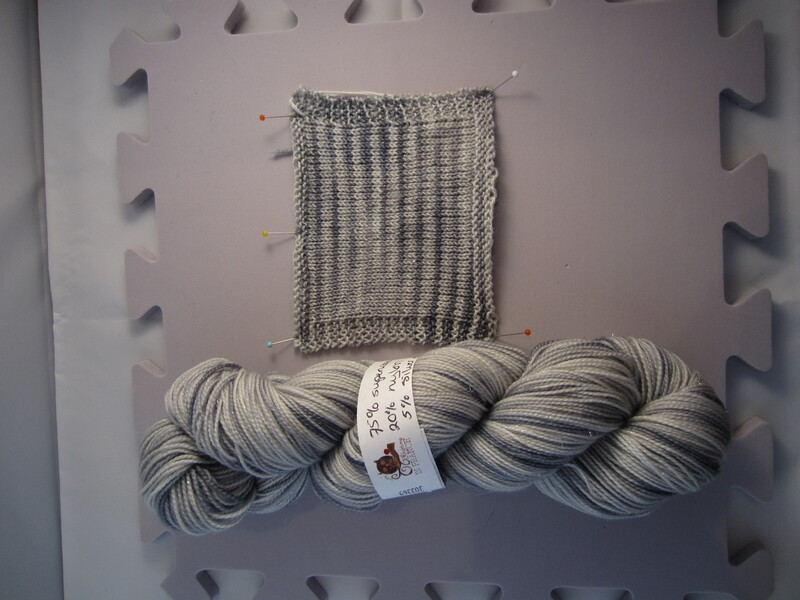 The grey is from a Cascade heritage yarn and the multi coloured is the same as in the socks above. 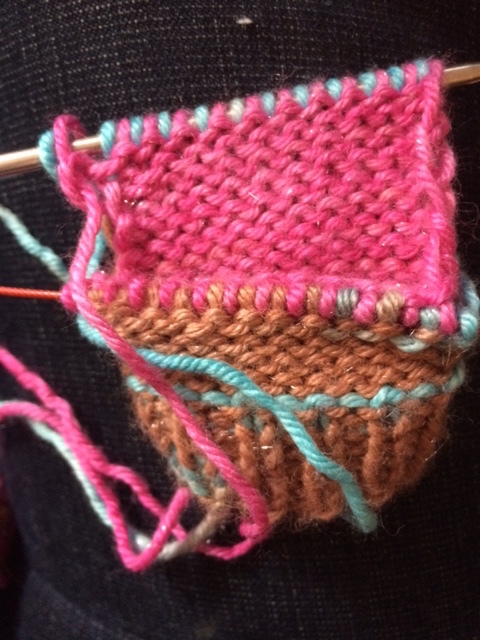 I’m doing a broken seed stitch on the front of the leg and regular jersey/knit stitch on the back/sole. 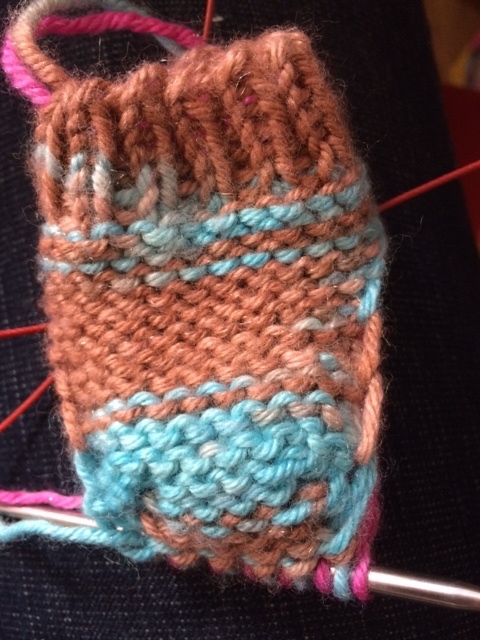 Look at the pictures to see how the stitch pattern changes the perception/look of the socks. 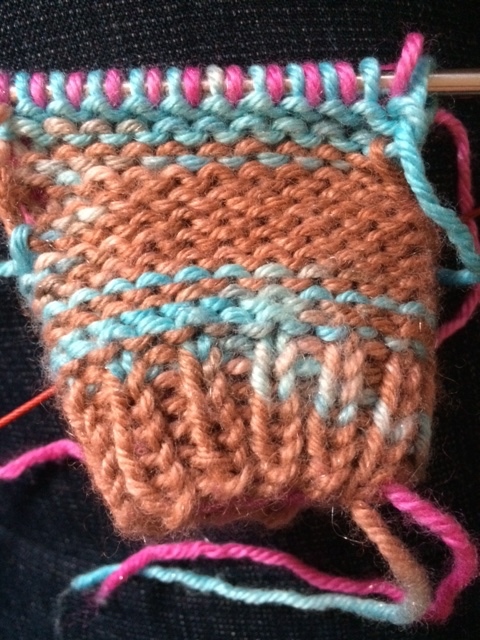 On the front the colours are muted by the broken seed stitch where as on the sole the multi coloured yarn really pops. Which look do you prefer?